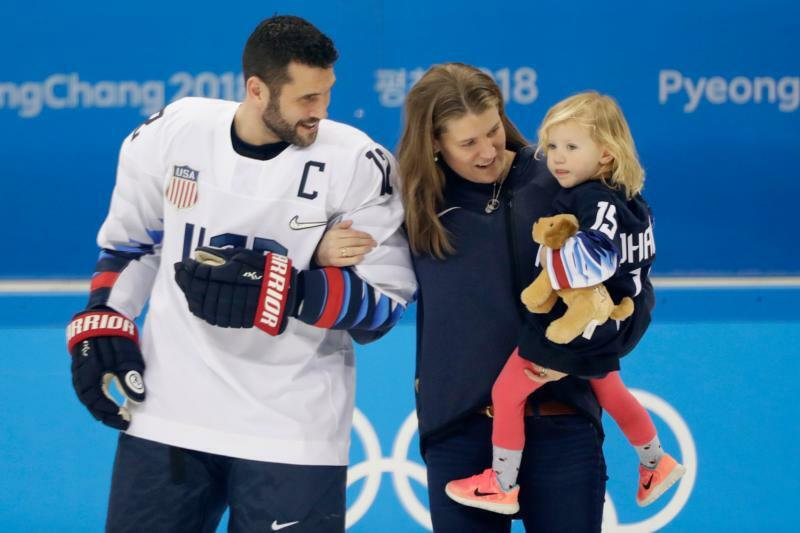 WASHINGTON (CNS) – Brian Gionta, captain of the U.S. men’s Olympic ice hockey team, competed in the 2006 Winter Games and played on three NHL teams, but his skating roots go back to his Catholic high school and college teams. Before playing with travel teams in high school, Gionta was on the hockey team at Aquinas Institute, a Catholic middle school and high school in Rochester, New York. In college, he played for the Boston College Eagles and was the team captain in 2000-01, when the team won the national championship. Now, as the Olympic team captain, he carries a torch of sorts as the 25th former Boston College player to have a spot on the U.S. men’s Olympic team and the second player from the Jesuit-run school to be named the team’s captain. Gionta’s role will not just be on the ice but as a team leader with experience. At 39, the New York father of three is the oldest U.S. athlete at the 2018 Winter Games. “I’m not that old,” he joked with an NBC reporter at Pyeongchang. Gionta has played for the New Jersey Devils and was on the team in 2003 when it won the Stanley Cup. He has also played, and was captain for, the Montreal Canadiens and Buffalo Sabres. Most recently, he described himself as semi-retired playing on the practice squad for an American Hockey League Club, the Rochester Americans. This enabled him to sign on with the Olympic team since the NHL, for the first time in 20 years, chose not to send players to the 2018 Winter Olympics amid disputes between the league and the International Olympic Committee. That move to not send NHL players has plenty of fans hoping for a “Miracle on Ice” reboot when Team USA amateur hockey players won the gold against the favored Soviet Union’s team in 1980. Since that dramatic victory, the U.S. hockey team has won silver in 2002 and 2010. In this year’s games, Team USA’s men’s hockey team lost its first match Feb. 14 against Slovenia 3-2 in overtime. The team had two preliminary matches before qualifying rounds.Team USA beat Slovakia 2-1 Feb. 16 in Pyeongchang and will face Russian athletes Feb. 17. In 2002, when Gionta was signing autographs at a parish festival, the Catholic Courier, diocesan newspaper of Rochester, caught up with the local rising star. Gionta, who attended Our Mother of Sorrows Parish in Rochester when he was growing up, told the newspaper that he just enjoyed playing hockey. “I don’t do it for the recognition. I just do it because I love it, and to have fun. I work hard and never take it for granted. I don’t throw it in anybody’s face. There are a lot of people in the world who aren’t as fortunate,” he said.